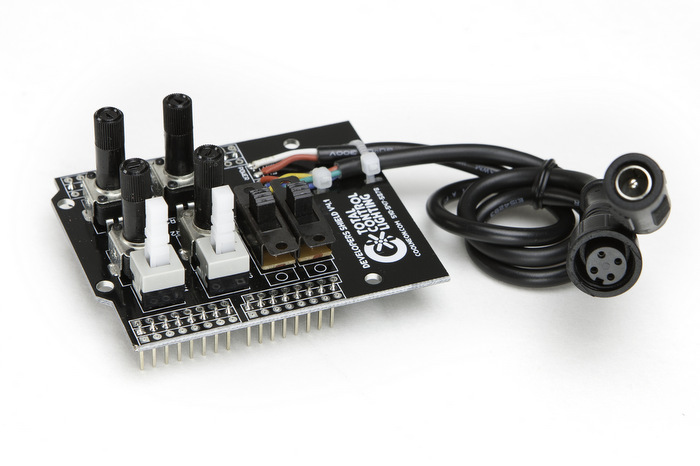 Our Developer Shield includes 2 momentary buttons, 2 two-position switches, and 4 10K ohm potentiometers that can be configured as inputs to the Arduino. A +5v DC power input cable with a 2.1mm jack is compatible with the wall-wart power supplies that we sell, which will power the Arduino as well as the lights. 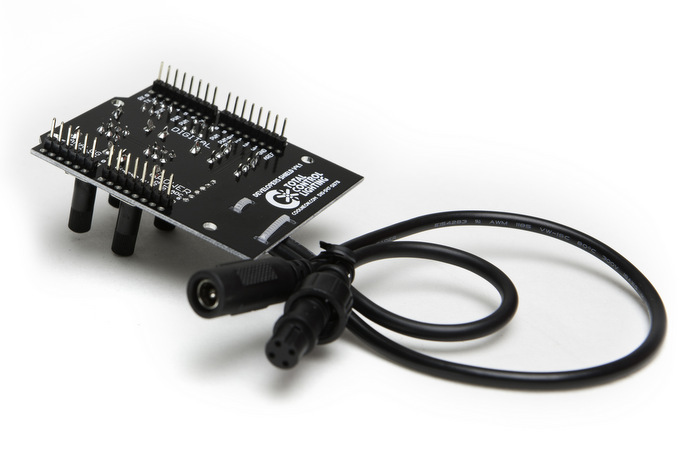 It also comes with our female waterproof 4-pin output connector for connecting directly to the Total Control Lighting pixel strands. If you hold the Developer Shield so that the two-position switches are at the top and the potentiometers are at the bottom (upside-down in terms of the photo above), then going clockwise from upper-left the potentiometers connect to analog input pins 0. 1, 2, and 3. The momentary switches, moving from bottom to top, connect to digital pins 4 and 5. The 2 two-position switches from bottom to top connect to digital pins 6 and 7. When closed, the switches connect the pin to ground, so you should configure them to use the internal pull-up resistors. Some of the Developer Shields' momentary switches are melted backwards so they are normally closed instead of normally open. This can easily be fixed in code. Go to Chris de Vries' site for code examples. The Simple Shield is the fastest and easiest way to connect an Arduino UNO to Total Control Lighting. It’s just a shield with a female TCL Connector, with the Clock and Data already connected to pins 11 and 13. No Soldering, No Hassle! Just mount the shield and plug it into your strand. (4 x D, or 4 x AA), or a USB adapter (for up to 100 pixels). With our Total Control Lighting strands of pixels -- Each option plugs into our Gateway or Elite Controller and our Power-T Connectors with a 2.5mm barrel connection. Our Pro Controller requires the House Current option. Please Note: One power supply and Power-T Connector are needed for every 100 pixels in your project to keep them glowing bright from end to end.